St. Charles Catholic High School students and alumni recently celebrated homecoming. The opening prayer was led by Student Council Vice President Kehara Hill, and the National Anthem sung by Carly Trepagnier Flynn English teacher, Creative Writing Club Sponsor, Retreat Team Sponsor, Starstepper Sponsor and 2009 graduate . 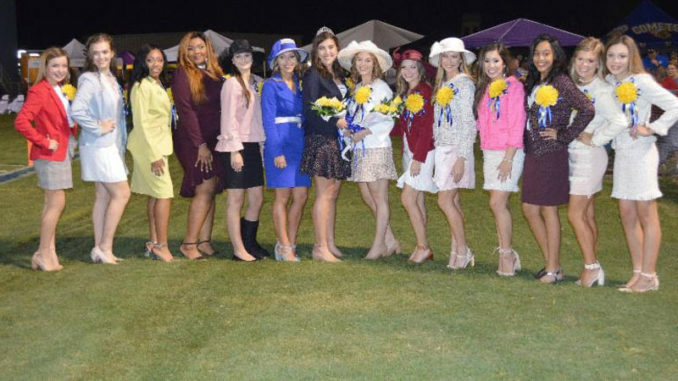 Before the game, the celebration included an alumni cook-off, a motorcade featuring the homecoming court wearing suits and riding in shiny convertibles, and the crowning of the homecoming queen took place at halftime. 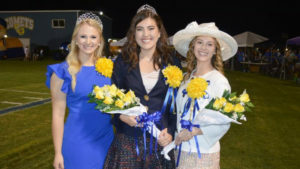 The SCC Homecoming Court members were chosen by a vote of the student body. The SCC Homecoming Court and Alumni Escorts included Eighth Graders Jenna Bosco escorted by Mr. Colin Bosco, Class of 2014, and Camryn Triche escorted by Mr. Marty Duhon, Class of 1987; Freshmen Julia Gilberti, escorted by Mr. Brennan Gilberti, Class of 2017, and Allison Powell escorted by Mr. Thomas Malik, Class of 1981; Sophomores Melody Newsome, escorted by Mr. Dylan Bardell, Class of 2012, and Alexis Jones escorted by Mr. Brandon Simmons, Class of 1996; Juniors Morgan Figuero escorted by Ty Monica, Class of 1998, and Wintress Landry, escorted by Mr. Hernandez Robottom, Class of 1977. Alumni also escorted the six senior members of the 2018 Homecoming Court. The senior court members and their escorts included Bailey Bourgeois, escorted by Mr. Adam Williams, Class of 1993; Keri Clement, escorted by Mr. Luke Jackson, Class of 2013; Sara Guidry, escorted by Mr. Edwin “Jay” Guidry IV, Class of 2002; Maddie Millet, escorted by Mr. Jared Trege, Class of 2013; Brooke St. Pierre escorted by Mr. Justin Chauvin, Class of 2001; and Kelsie Williams escorted by Mr. Drew Pregeant, Class of 1991. Senior Bailey Bourgeois, daughter of Curt and Tiffanie Bourgeois, was crowned queen at halftime. She has been a three-year member of the Art Club and the swim team. Bailey is also in Student Council, and on the Pep Rally Committee, tennis team, and track team. Senior Keri Clement, daughter of Jane and Darren Clement, was named as the Maid of Honor. She has been a member of the Stagehands for the past four years and is also a member of Student Council, French Club, Ambassadors, Retreat Team, and Pep Rally Committee and is a Eucharistic Minister and also captain of the Starsteppers. The football team had a big win over Lusher for Homecoming 2018. The Annual Alumni Cook-Off was also held that night. Alumni cooks served great food from shrimp & grits to red bean gumbo. The cook-off winners this year were “The Murphy’s and whoever shows up” sponsored by Mike and Giselle Murphy. They served a delicious dish of shrimp and crab cream sauce over fried fish. St. Charles Catholic High School Homecoming 2018 was truly a place where friends, faith, and football came together all in one night.